Succession Planning: Where Do I Begin? November 6, 2018 /in HR Strategy /by strategic HR inc.
We’re a small company that has been growing fast and a key member of our leadership team is likely to retire in a few years. We’re not prepared to lose this person, or any other leader in our organization, for that matter. Can you give us advice on succession planning? Absolutely! We’re happy to share guidance on succession planning! You’re wise to be proactive and also lucky to see the potential loss of your leadership team member ahead of time. Sometimes companies can be caught unaware to the loss of a key leader through a sudden resignation, a traumatic or terminal illness, or a catastrophic event impacting many key employees. This is why it is critical for every organization to put time into succession planning to avoid a significant disruption in internal processes and to circumvent a negative impact on customers/clients when you lose key players on your team. You are not alone by not having a succession management plan in place. Brandon Hall Group’s recent State of Succession Management Study found that “84% of organizations report having a lack of candidates in the pipeline ready to assume open and critical positions.” This study also reported that most organizations intend to increase their investment in succession planning – viewing it not as a “nice to have,” but rather as an essential component to the health and well-being of their organization’s future. Review your organization’s strategic plan paying special attention to your expected growth and the position needs of the future. Keep in mind that the organization will likely have positions that vary slightly from what they look like today, so be sure to consider this when creating your succession plan. Also ask yourself what types of leaders are needed to support the organization’s strategic plan and organizational culture. Review and understand your current workforce. Some questions to ask yourself include: How many of your employees are eligible for retirement in the next 1-2 years? 5 years? How many of them are managers or in key positions? Are there individuals in your organization who might be ready to fill those roles at that time? If not, what do you have to do to get them ready? You’ll need to identify the key positions in your organization that should have a formal succession plan, along with the key competencies and experience that will be required for someone to be successful in each role. Remember to look beyond your senior management team. There are often roles outside of your senior leadership team where the sudden loss of individuals in those roles would cause great disruption to your organization internally and/or for your customers. Create a succession plan not only for senior management, but also for those “high risk” positions. Identify high potential employees who may be able to move into key positions if they are provided the right training and development. If you have a good performance management system in place, this can be a great tool to start identifying these high potential individuals. If your performance management system is not robust, not consistently used, or lacking altogether, this is an assessment tool you’ll want to develop for your organization as a whole – not just for your potential leaders. Both the employee’s current performance as well as their potential. Who are the employees who have mastered their current role and might be ready for a more challenging role, provided they receive the right training and development? Who are your high performers that are better suited for subject matter expert roles or roles that do not require managing others versus those who have the potential to excel as great leaders? Who are your “ready now” individuals? Who are your “ready later,” meaning will be ready in one-two years provided that they gain the necessary knowledge/skills/experience in specified areas. After identifying potential new leaders, have a conversation with them to understand their career goals and interest level in taking on a more challenging role. If they are interested, then you can work to create career development plans that will provide the training/development/mentoring that’s necessary to groom them for when advancement opportunities arise. An important part to the success of a career development plan is to revisit the plan regularly to make sure that you are on track to meet your goals and to adjust if strategic goals or position needs change. According to our HR Support Center, not only is it more expensive to bring in outsiders to replace high level employees, “it takes more time to bring outsiders up to speed and impart the organizational knowledge necessary to be a successful leader. Cultivating the employees you already have will not only save you money, it will improve morale and create loyalty. If employees know you’re willing to invest in them and their career path, they’re much more likely to give your organization their best.” At a time of record low unemployment rates and increasing job opportunities, employee engagement is more important than ever. If investing in and grooming your high performers for growth opportunities results in their increased commitment to stay with your organization, that is a win-win for all! Hopefully, this has provided you with enough information to get started on developing your succession plan. We wish you and your organization continued growth and success! 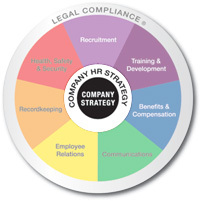 HR Strategy involves thinking ahead to the future and strategizing to meet goals and objectives. It also entails working cohesively with the corporate strategy. strategic HR inc. knows how integral human resources is to the success of an organization and can assist you with HR strategy needs. Visit our HR Strategy page to learn more about how we can help you create your strategy and align your HR needs with the corporate strategy.